A group of Salt Spring residents is urging the Islands Trust to do more to combat climate change and to reflect that in its upcoming budget. “Islands Trust needs a wake-up call to put climate action on their agenda,” states a letter signed by Elizabeth White and 15 other people. They want the Trust to declare a “climate emergency,” an action the Capital Regional District Board is seriously considering. 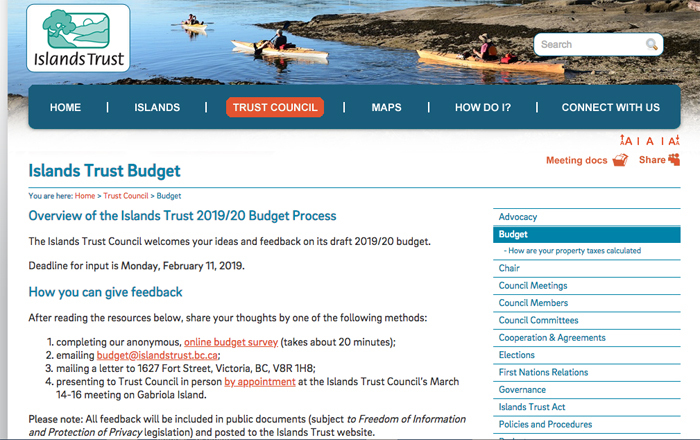 With the Islands Trust requesting public feedback on its 2019-20 budget and priorities until Feb. 11, the group is asking islanders to express their concerns about climate change through that forum. The Trust has a 33-question survey on its islandstrust.com website, which canvases respondents’ opinions about how Trust funds should be spent and related matters. At a special Trust meeting held on Salt Spring on Jan. 26, Trust Council chair Peter Luckham asked people attending to take the time to complete the survey so that trustees had more input to work with in advance of their next quarterly meeting in March when the final budget will be approved. The Trust is proposing a $7.89-million operating budget for the 2019-20 fiscal year, which is two per cent higher than the previous year. Also signing the letter were Peter Lamb, Jean Gelwicks, Ann Wheeler, Geoff Bartol, David Denning, Simon Wheeler, Jane Squier, Maxine Leichter, Dion Hackett, Jim Standen, Barbara Dempster, Ron Watts, Dennis Lucarelli, Michael Bushby and John Borst. They note that the Trust’s 131-page 2018 annual report devotes just two pages to climate change action, focusing on reducing travel emissions by staff and trustees. “In 2017-18, Trust Council received consultants’ reports on climate change adaptation, and delegations from climate action groups. But as far as we can tell, not even one dollar has been specifically allocated for climate-related activity in the 2019-2020 budget,” they state.